You guys, I have a secret. I have a team of kitchen assistants that help me get meals to the table a bit more easily. No, I’m not talking about a maid or a butler or anything like that. I’m talking about my team of small appliances that help me in the kitchen. They save me time and money and I’m not sure what I would do without them-they have become fixtures in my daily meal prep. You may have a few of these too—or be looking for something to add to a wish list for the future. Here are six of my favorite and most used small appliances that I love—my Ultimate Kitchen Assistants! I use my slowcooker at least once a week! I love getting dinner ready in the morning and knowing that after a busy day, we can have a home cooked meal that is not only cheaper than going out to eat, it’s most often better for us too. I have two different sizes but the one I use the most is this one because it has a timer on it that will automatically switch it to warm when the food is cooked so I don’t have to worry about overcooking. Of course, you still have to prep the food that goes into it but your active cooking time is cut significantly because it’s doing the cooking for hours while you do other things (even if it’s something fun like go to a movie!). Soups, sauces, meats, appetizers—and even desserts—you can make all kinds of things in your slowcooker! I still like to puree some foods like carrots or spinach to save in ice cube trays so it’s easy to add them to sauces or smoothies and things. But I also like my food processor for shredding or grating cheese or vegetables and also for making sauces like homemade pesto or hummus. I also use it to make things like these Oatmeal Cinnamon Raisin Energy Bites. I got my stand mixer as a wedding gift over 20 years ago! It’s one of those things that I put on our registry and wasn’t really sure I needed but was so happy to receive it. I love to bake and have found it to be SO handy to have. It is heavy so that’s one drawback but I like it because I can set it to mix up my ingredients and walk over to the refrigerator or pantry to get other ingredients for my recipe. If a stand mixer is out of your budget, a hand mixer is a bit more of an economical choice. I used to have one of each but when I over heated my hand mixer by trying to mash potatoes (let’s just say, I got a little overzealous about mashing potatoes!) I decided to get by with just my stand mixer—so far so good. I’ve had my Salad Shooter so long I don’t even know how long! I remember my sister and I both had one and something broke on hers and she loved it so much she had to get a replacement right away by ordering a new one online! If you want a more budget friendly option to the food processor for shredding cheese or vegetables, this is it! I don’t like to by pre-shredded cheese because it has more preservatives in it than buying a large block of cheese that I can shred myself. Plus, that saves me money! I just shred up a whole block of cheese, such as cheddar or mozzarella, and store in a ziptop bag in my freezer. Then I can grab what I need for different recipes. The Salad Shooter comes with multiple “blade” units that you can switch out for different grated styles. It’s also great for shredding vegetables like carrots or zucchini or potatoes. Sometimes I will freeze these ingredients (not the potatoes unless you prep them like the Roasted Rosemary Potatoes) to throw into quick breads or soups later. It’s a great way to prep fresh produce when you have a surplus from a garden bounty or a great sale at the store. Remember when everyone was getting bread machines about 15 years ago? I did and I still have mine! Yes, they can be bulky but if you have the space for one they are great for making your own homemade bread for sure. But I also really like to use mine to make bread doughs that are then finished in the oven. It does just the right amount of kneading and sets just the right temperature for accurate rising. I love using it for homemade pizza dough! I also make banana bread and other quick breads. There are all different models with different bells and whistles but admittedly, mine is pretty basic. If you want to try one and not spend a lot of money, check the thrift stores or garage sales. I’ve also seen them for sale in my local neighborhood online for sale page. You can get some good deals on older models that way but that can still get the job done! I use my blender most often for making smoothies but it’s great for pureeing foods too. It’s a more economical option than a food processor if you don’t have a lot of ingredients to puree. I had the same blender for almost 20 years until it finally burned up and was done! I got mine at Costco when they were having a special deal on them but you can also order online. I know some people have the Blendtec which is a more economical upper level blender. I only heard about it AFTER I had bought my Vitamix. I use our toaster oven ALL the time! To toast breads but also to reheat and bake foods. Like my blender, I had my basic toaster oven for over 20 years until it decided to kick the bucket. That year I received some gift money for the holidays and decided to splurge on a higher end toaster oven—the Breville Mini Smart Oven with Element IQ. You can also use your food saver if you purchase meat in bulk and have a deep freezer. By vacuuming out the air and using their bags, you can save a lot of money! 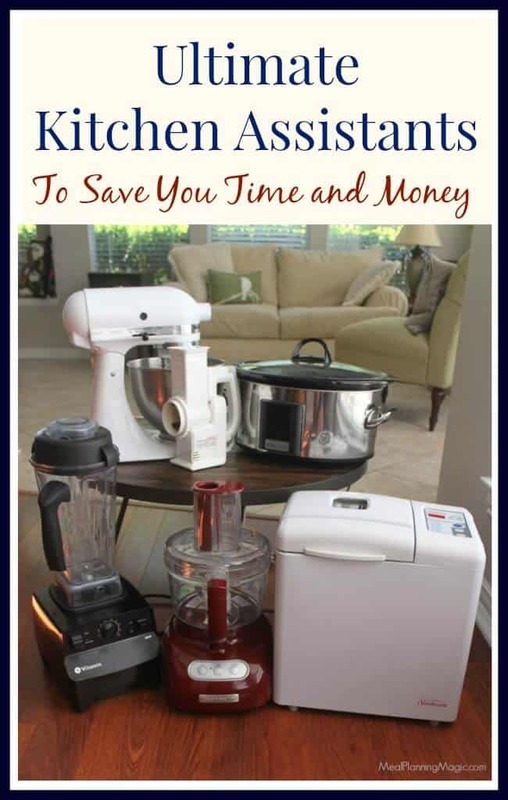 What kind of kitchen assistants do you rely on to help you save time and money in the kitchen?